Scroll below for a first look at what's new for Annual Conference 2013. LAKELAND – Ask Bishop Ken Carter how many miles have been logged on his SUV since he settled into the episcopal office Sept. 1 and he just shrugs and laughs. What he thinks about is the Methodist tradition of itinerancy and the knowledge gleaned from traveling across a state that measures 500 miles from north to south and cradles a widely diverse population. "I equate it to having been a pastor for 29 years," Carter said this week in an interview. "What I always enjoyed about being a pastor was meeting people on their own turf. … I always find that's renewing to me, even if it does involve travel." This month he completed his visits to all nine districts in the Florida Conference, a connectional body of nearly 700 churches and missions, plus affiliated ministries like Florida Southern College, Bethune-Cookman University, the United Methodist Children's Home, South Florida Urban Ministries and others. Bishop Ken Carter and his wife, Pam, share a meal with members of the Handicapable Ministry of St. Paul UMC, Largo, one of many churches and ministries all over the state of Florida they have visited since he began episcopal service in September. Photo from St. Paul UMC. With his wife, Pam, Carter has visited big churches, small churches, ethnic congregations and those where people of different heritages come together. He said he tried to spend a few days in each district so he could form realistic impressions. The result? "I think both Pam and I have enjoyed our first few months here, and we've been energized by the faithfulness of people and the love they have for the church," Carter said. "People are really trying to connect the gospel with the human needs of our state and the needs of our church. … I think there are some real innovations in some of our churches and in some of the lay and clergy leadership." Carter said the conference was weathering the winds of change before he arrived, grappling with shifts in public perception of organized religion and the severe economic downturn that reduced financial gifts even as the outcry for ministries addressing hunger and poverty skyrocketed. Conference leaders before him laid the groundwork for addressing new needs by restructuring the districts from 14 to nine and creating a Strategic Leadership Team that developed a blueprint for moving forward as a conference, Carter said. "There is now a sense of urgency," he said. "We really have to align our resources with that work." Among the biggest shifts in thinking will be accepting that religious institutions can no longer take positive public perception for granted. In some ways, the bishop said, the atmosphere is similar to the days of early Christianity, when Jesus' followers worked hard to convert others to the faith. "I think [the primary goal] is to see our state as a mission field," he said. "We're no longer in a church culture." He noted that the Florida Conference lost a bigger share of its membership in the last decade– 19 percent -- than any other conference in the Southeast. Some of that is due to Florida's high number of senior citizens and population migration trends, but even so, it is a challenge to address. And the biggest challenge Carter listed is to build "generational diversity," actively recruiting and nurturing young adults in the church. One way to do that is to enhance the sense of connection across the conference. Carter said he expects conference leaders to spend the next year developing a network of "teaching churches," where healthy congregations will coach and inspire others to build up their membership, attendance and ministry. "Some of the strongest churches in our denomination are in the Florida Annual Conference," Carter said. Those chosen must hear a call to share their gifts with other congregations, he added. "They will embrace as a core part of their mission the renewal of the Florida Annual Conference." As Carter prepares to preside over his first annual conference meeting coming up in June, he predicts that a new emphasis on connectional relationships and involvement will be evident. "The purpose of every annual conference is for people to come together and speak and help shape this church," Carter said. "It is their church. It's not my church…. My purpose as presiding bishop is to help this happen with fairness so that people are treated with dignity and so the church is able to move forward as a stronger body." The conference theme is "Becoming Disciples of Jesus Christ." The event will be held at The Lakeland Center. Preconference workshops will begin Wednesday afternoon, June 12. Those who arrive that day also will have an opportunity to participate in packing meals for Stop Hunger Now, an international hunger relief organization. Attendees will be able to participate again Thursday morning. The goal for the four-day conference meeting is 100,000 units packed. Organizers have a adopted a theme of "A Million Reasons," with a goal of putting together a million units in churches throughout the Florida Conference in the next year. • The bishop's offering this year will go to three ministries: to develop a conference-operated nurturing program for young clergy of color, to a building fund to replace aging facilities at the Florida State University Wesley Foundation and to Stop Hunger Now. • Individual United Methodists identified in advance will share personal stories of discipleship, either in person on stage or through video appearances, through an initiative called "Telling Our Stories." More information about this initiative will be posted next week. • On Thursday and Friday afternoons, June 12-13, attendees will be invited to small-group breakout sessions to discuss discipleship. • Conference attendees also will be able to add their voices through a comprehensive social media strategy that will be announced in the coming weeks. • To save money and promote environmental conservation, the conference this year will provide printed workbooks only to those who order them by April 1. 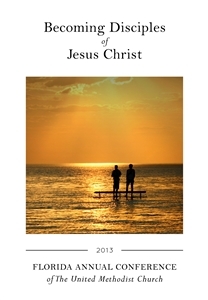 To order, click here or go to the bottom of the www.flumc.org home page and click on "2013 Annual Conf," then "WorkBook Order Form" on the webpage menu. *Susan Green is the editor of Florida Conference Connection.